Some other termite baiting systems disturb termites feeding in their stations whenever they are inspected or baited. This is because their station design requires that Interceptors must be removed and reinserted during inspections and removed and replaced with bait when the station is actually baited. 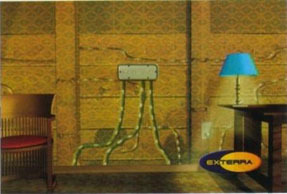 With Exterra this is not the case. Little or no disturbance at any time. Period. But how? 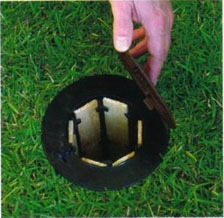 The unique open cavity design of the Exterra Inground Station allows the Interceptors lining its perimeter to be visually inspected during regular inspections for termite attack without being removed from the Station. And the Interceptors are also not removed or disturbed during the bait application process. Instead of removing the Interceptors to replace them with bait at this critical moment in the baiting process like some other systems, the open cavity Exterra Station design allows bait to be added to the Station without removing the Interceptors. During baiting the open cavity is filled with bait where the bait fully contacts the exposed inner surfaces of the termite infested Interceptors. 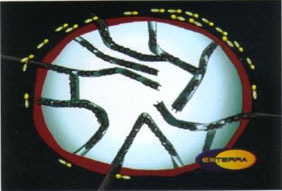 Because the bait used with Exterra is preferred by termites even more than the Interceptors, they quickly switch from feeding on the Interceptors to feeding on the bait. This low disturbance Station design and baiting method used with Exterra is so revolutionary, its patented here in Australia. f termites are actively attacking your home, experience shows that many species of Australian termites are best dealt with using Above-ground Stations, sometimes exclusively. Exterra Above-ground Stations can be invaluable because they allow your termite problem to be dealt with more quickly, right at the point of termite attack – right now. This can mean a significant decrease in the time between Exterra System installation and colony elimination. Almost any type of insecticide will kill termites if they consume it. However few toxicants can reliably eliminate a termite colony. Why is this the case? Because most types of toxicants are quick acting, meaning they kill an insect soon after the insect contacts or consumes it. A quick acting toxicant placed in a termite bait would cause the immediate death of any termites that found and started consuming the bait. Other colony members of the now dead termites arriving at the bait looking for food would discover their dead nest mates. These newly arriving termites would quickly realize that the bait was causing the death of their nest mates. These termites and all their other nest mates would then instinctively avoid consuming the bait. This would mean the bait had killed some termites but had failed to eliminate the colony. How can this colony-protective instinct be successfully defeated? in keeping with their colony duties they deliver food back to other colony members. Food that just happens to be toxicant-containing bait. If the toxicant ‘n the bait works slowly enough, the colony is unable to learn to avoid eating the bait because they can’t connect the death of more and more colony members with the consumption of the bait. The slow (but not too slow) speed of action of the termite bait toxicant used with Exterra (plus other attributes) makes it an optimal termite bait toxicant.